We are in full swing with our fall classes! If you are coming to campus after work or if you are meeting friends before class, Rice University has some great dining options for you to try. Visiting food trucks park on Mudd Loop Road (in between the Mudd Building and Hamman Hall). Inside the glass-walled Brochstein Pavilion is Salento, offering salads, sandwiches, specialty coffees and wine. You can enjoy your meal in the hub of campus overlooking our marvelous lawns. 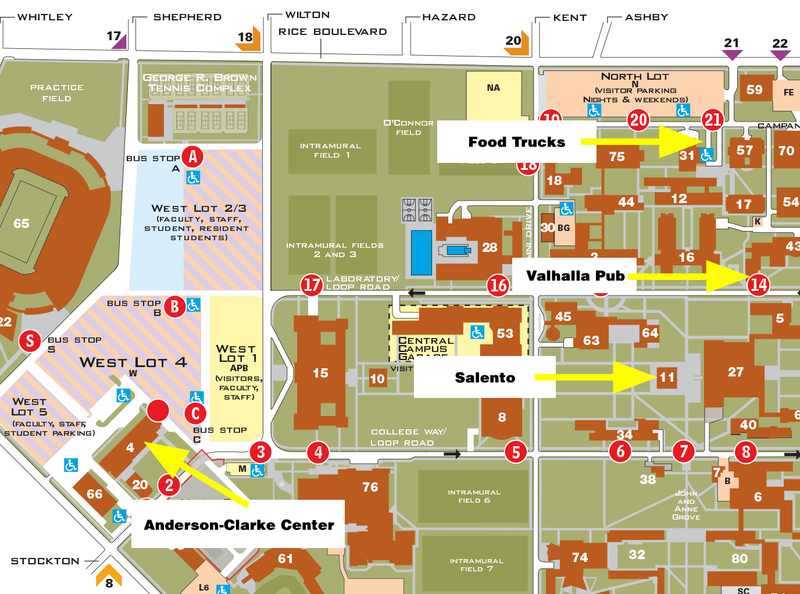 Before or after class, you can enjoy a beer and snacks in Rice’s famous graduate student-run Valahalla Pub. Snack on some food samples, macarons, a smoothie or just knock out some grocery shopping while you are waiting for class to start. 3:30 p.m. until 6:30 p.m. This entry was posted in General and tagged campus. Bookmark the permalink.